‘Don’t get beat and anything else is a bonus’. That has been my philosophy in this fixture ever since I first attended a game against that lot down the road. Regardless of form or personnel, these games are largely unpredictable despite the Mackems usually stating what they are going to do to us. It is rarely a day to enjoy but more one to endure. Hindsight is usually the only way of having any confidence over the result. 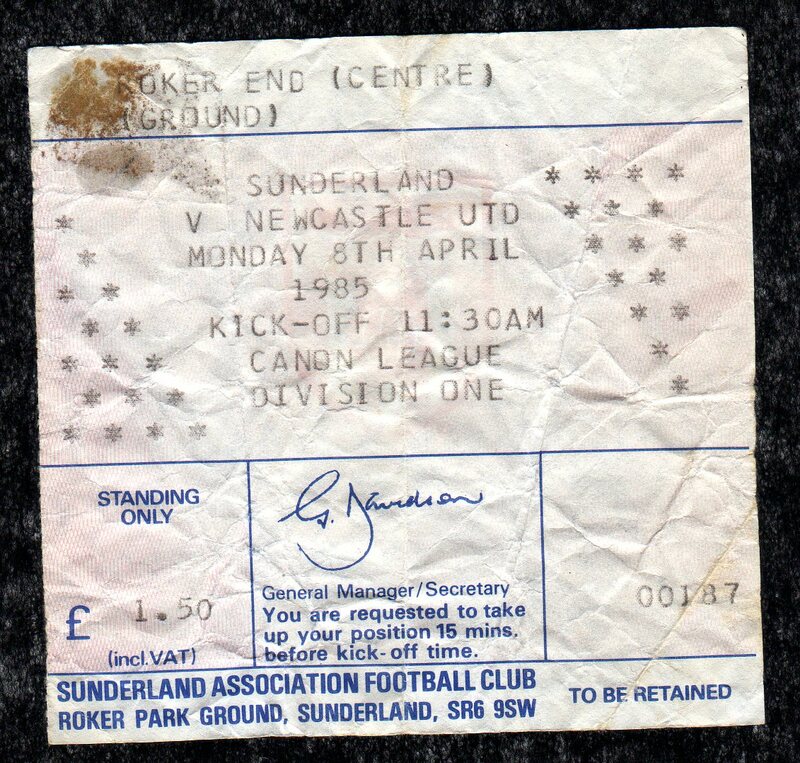 Bank Holiday Monday 1985 was my first ever visit to enemy territory for an 1130 kick off. It was £1.50 to stand as opposed to £39 to sit now (plus the quid in Mike’s back pocket). I don’t know how this compares in terms of inflation but it seems excessive and just plain wonga (ahem). I was 14 years old and went on the train with two pals from school, Jeff Wightman and Mark Francis. The days of being escorted by the boys in blue from Seaburn Station to the ground. It was a canny shank with some friendly banter (surprisingly) with the odd Mackem on the other side or the cordon. That all changed on the return to the trains in October ’92 as avoiding bricks being hurled from the rat runs was the order of the day, cowards!! Given the new transport policy I’m expecting a return to those days as people choose the Metro over the £5 bus fare. (Robbie is also a columnist in our monthly magazine, read his latest column in our 48 page magazine which was out on Saturday (13th October) – get the New Mag for only £3 plus postage and subscriptions are also available from £23). I don’t recall much of the action on the pitch in ’85 as it was pretty uninspiring, which would continue until my fourth visit actually produced some goal action in a 1-1 draw in 1991. That game saw possibly my favourite Derby Day goal from Liam O’Brien which in my opinion was better than his quite rightly much vaunted winner 12 months later. 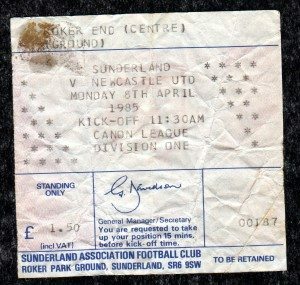 Firstly, on arriving at the turnstiles my 2 pals’ tickets were for a different part of the away end so that was the last I saw of them until we got back to school. Although I was then technically on my own, the reality was I had thousands of mates just like many away games since. Secondly, was the outbreak of fans in the home end. Newcastle fans, bloody hundreds of em emerging and making their way down the side of the pitch as the game was in progress. I have no idea how many got chucked out but I know many made it safely into the away end. It was just one of those amazing sights that you can’t explain and don’t see much of, although at my next away game at Anfield there was a similar outbreak, mental. In ’96 I’d find myself alone among the enemy since away fans were officially banned for both fixtures. That’s a tale for another time though. Finally, the journey back to the train. As we approached the station the police had stopped anyone else getting onto the platform as it was probably already full. However, nobody explained this to the rest of us trying to get back to civilisation and the bodies just began squeezing tighter and tighter together until my feet weren’t touching the ground anymore. I admit for a few minutes I was a bit concerned (bricking it if the truth be known) as I was struggling to breathe and had to almost literally fight for room to get some air and plant my feet back onto terra firma. Policing seems to have moved on at this fixture, except when it comes to tramps invading the pitch obviously. The after effects of Hillsborough, which are still rumbling on today, have minimised some of these occurrences. However, in those days these situations were not uncommon to many fans both inside and outside of grounds up and down the country. Many fans of our generation still talk about the FA Cup game at White Hart Lane in ’87, some years before Hillsborough. It was nearly our club. Back to this Sunday then.It will require a strong referee as one thing is certain and that is the Mackems will try to kick us and intimidate us. That’s their usual tactic. Pistone had his leg broke without even a free kick awarded in this fixture. We must not rise to the bait. 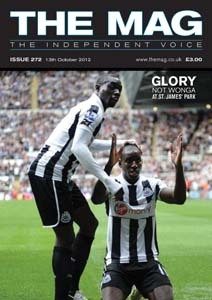 We must keep our discipline (Tiote, this means you) and let the ref deal with the inevitable assaults. Hopefully the officials will spot the odd blatant handball on the line too and make the right decision this time. The rest is down to Pardew getting the team and tactics right and us to be professional and play to the best of our ability. We need all eleven to be up for this one. It is not a game for carrying any passengers. Then if the chips are down we must hope Shola has his lucky underpants firmly strapped on.